While I’m currently playing catch up on some shows I missed several episodes in the last few weeks, now is a good time to revisit some of them before I fully transition over to my Spring Anime backlog. Lately, I’ve hit something of a writer’s block in my creativity. I come up with an idea, I start writing a paragraph or two... and I stare at a mostly blank screen for several minutes. Getting started is normally the hardest part of writing (for me anyways), but I’ve been attempting to get some in as time permits with the goal of publishing at least one piece a month. Anyways, today I’m shifting gears from gaming to my other favorite pastime: Anime. Lately, I’ve been listening to quite a bit of Anime Soundtracks (Anisongs) and some of you might have already seen me post a few in my recent Playlists/Soundtracks posts. This article is primarily focused on my personal favorites throughout the season. What Anime Qualifies (or how do I generally pick these)? My general rule is anything that premiered or aired during a given season is fair game. This includes anything that aired in a specific region, on TV if it was making its debut (i.e. Toonami), or on a streaming service (i.e. Netflix, Funimation Now, Crunchyroll). How I differ from most lists of this nature is if an anime debuted in one season and was region locked, service exclusive, or was available subbed only (usually a combination of the three) and debuts again in a later season for the first time elsewhere or received an English dub much later, each release can qualify in either instance in the event I miss one or the other. Because I tend to miss shows every season or watch a show subbed first then dub later, this is to highlight shows at least once during one of their respective runs if I exclude something during its initial run. How are the Winners Selected (or what is my criteria)? Almost there now if you haven’t checked out already! So the bulk of these are going to be focused on Anime Openings and Endings (sometimes both within the same series/show), though individual pieces used within a series are also eligible. As music is a very subjective topic, the bulk of my picks will mostly be shows I’ve actually watched this season and how much I enjoyed a given piece of music (or at least didn’t skip over the opening/credits!). However, I do look at how well a given piece complements a show/opening/credits. I have a confession to make. Even though I loved the original Basilisk, I did not care for the first opening, Kouga Ninpouchou. Actually, it might have been grating on the fact my sister obligated us to listen to it EVERY single episode, followed by trying to learn how to play it, but my curiosity for the band did stick as I later started to discover their discography. Fast forward to today, and I absolutely love this band! Being an avid metal listener and adoring TV and games based on historical Japanese settings, Onmyouza outdid themselves with their latest contribution to Basilisk. As they are returning for the upcoming second season, I’m very excited to see how their second track shapes up. Editor’s note: Sorry, I couldn’t find the actual opening used in the show, so I just posted the official audio from the band’s YouTube page. This may be one of the most catchiest theme songs of the season to be honest. Aside from capturing the insanity and randomness of the show itself with its flashing imagery and electronic sounds/beats, I couldn’t help but crack a smile everytime POP TEAM EPIC started playing. The TV getting smashed at the beginning is a cute metaphor to the self awareness that this show is obviously one big joke. Fun fact: Sumire Uesaka is also the voice of Pipimi in the Japanese version (episode 3). 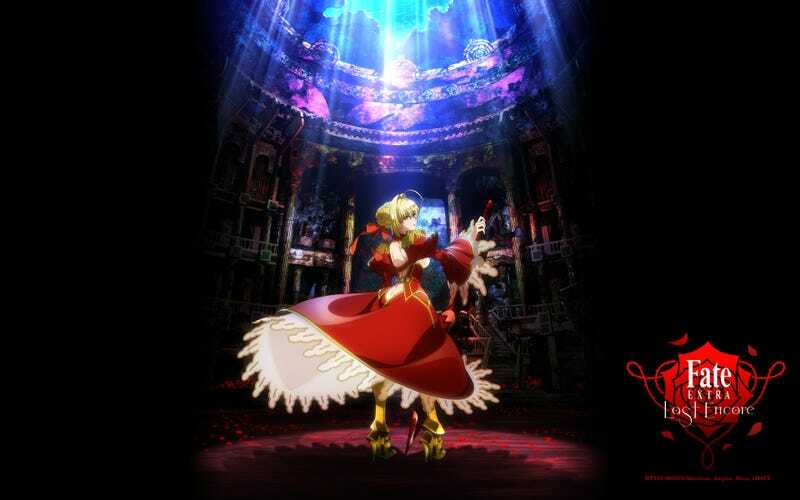 Fate/Extra’s opening at first didn’t say much about the series as a whole, but as I’ve watched more of the show, it begins to paint a different picture. Without giving away too much, the world of Fate/Extra is a barren wasteland with few inhabitants. From the opening piano to the transition into guitar and the song itself, there is a sense of sadness and beauty painted in the scene itself watching Saber fight an unseen force. Takanori Nishikawa, best known as T.M Revolution has contributed quite a number of Anisongs over the years, but this marks the first time he has contributed one under his real name. If you are familiar with his other works, his new single might be a bit different from what you’re accustomed to. Personally, I found it to be a nice change of pace and a chance to stretch his wings and try something different. Plus I’m also a big fan of orchestra and guitar pieces, especially when the two are combined. For some baffling reason (probably Netflix), the official theme song was moved over to the credits and the opening used was a 15 second clip with some visuals and some background singing. If I had to pick an outright favorite of the season, this is it (with Bright Burning Shout a close second). Marty Friedman (formerly of Megadeth) teamed up with MAN ON A MISSION’s Jean-Ken Johnny, and KenKen for this song. From the chilling opening lyrics to that powerful transition into guitar in the full version (not the video above), The Perfect World embodies the cruel circumstances its two lead characters find themselves under. It has quickly became a favorite on my personal playlist after briefly listening to it in the promotional trailer and finding the full version later on. Entering the series finale, LiSA’s ASH gave the series a sense of urgency that we would likely be seeing these characters for the last time. Every servant (who is still in play by now) gets a spotlight. For a brief moment, there is a sense of calm as each major character reflects for a moment before the opening transitions into straight up battle scenes and the song intensifies in what is shaping up to be the final battle before transitioning back to a peaceful setting in the closing moments of the song. This being the third Netflix title, I just want to point out that my Anime backlog does not solely consists of Netflix titles. Though the second series on this list to have first debuted last year and made its U.S. premier in January, I can safely say it was worth the wait for this one. Onto the song itself, with its Jazzy uptake and “suggestive” imagery, you get a sense of the show’s major themes and its portrayal of gambling and pleasure. Aside from Pop Team Epic’s opening, I could not think of one other show that was in perfect sync with its opening/ending, but Deal with The Devil might be this season’s most outstanding visual anime theme song. I don’t often listen to the credits in full as I can usually tell whether or not I’ll like it, so I had tuned out after the first 5 seconds. Throughout the series, it would occasionally start playing over the ending scenes, so it was during those points where I had the opportunity to revisit it. There were a few episodes throughout Violet Evergarden’s season run that managed to move my cold, undead heart (heh), but there two episodes in particular that, well, to steal a quote from Nier: Automata: “I cannot deny the feeling of something resembling consciousness and emotion being born” (and may or may not have teared up a little inside). I won’t go into spoilers as I recommend watching the episode in full (actually, go watch the series! ), but the clip itself is here if you are interested. Now I can’t help but think to that particular scene whenever Michishirube starts playing. Well, I ended up adding two more soundtracks to my initial list of five, so there you have it. What were your favorite anisongs of Winter 2018? Any outstanding or epic moments during a given show? Like, comment, and discuss below!